It’s springtime in DC. That means squirrels are everywhere on the National Mall. Take a walk around the Mall and you are bound to see a squirrel or two run across your path. Sit on a bench for a few minutes and you might hear a rummaging sound and then see a squirrel pop up out of a trash can. And you are sure to see a squirrel or two getting their picture taken, sometimes looking as if they are posing for the camera! The Trade Literature Collection at the National Museum of American History Library includes catalogs on a lot of different types of products. Would you guess there are even catalogs about squirrel cages? One of these catalogs is from March 1885 and is titled Catalogue of the Osborn M’F’G Co. Most of the catalog focuses on bird cages but there are two pages about squirrel cages. Osborn Mfg. Co., New York, NY. 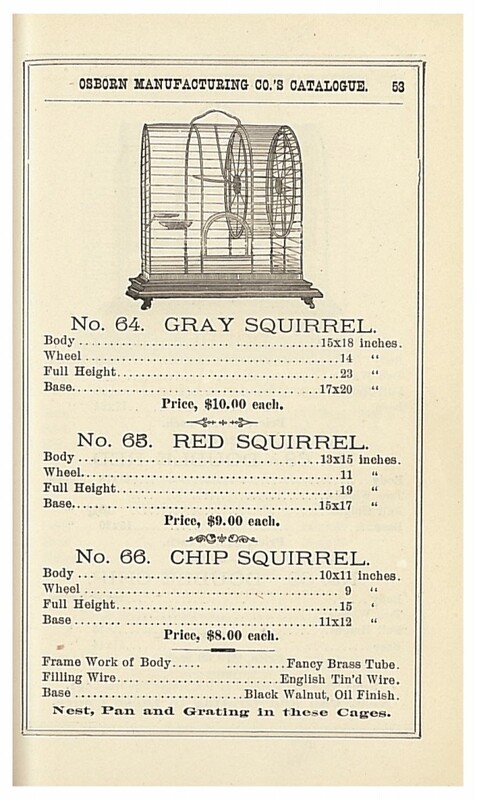 Catalogue of the Osborn M’F’G Co., 1885, page 53, cages for a single gray squirrel, red squirrel or chip squirrel. The catalog includes cages for gray squirrels, red squirrels, and chip squirrels. The cage sizes varied depending on the type of squirrel and whether one or two squirrels lived in it. Although it does not sound too spacious, the gray squirrel had the largest cage. A cage for a single gray squirrel measured 23 inches tall with a cage body of 15 inches by 18 inches. The red squirrel’s cage was slightly smaller at 19 inches in full height. But the chip squirrel had the smallest cage of all at 15 inches in full height with a cage body of only 10 inches by 11 inches. Osborn Mfg. Co., New York, NY. 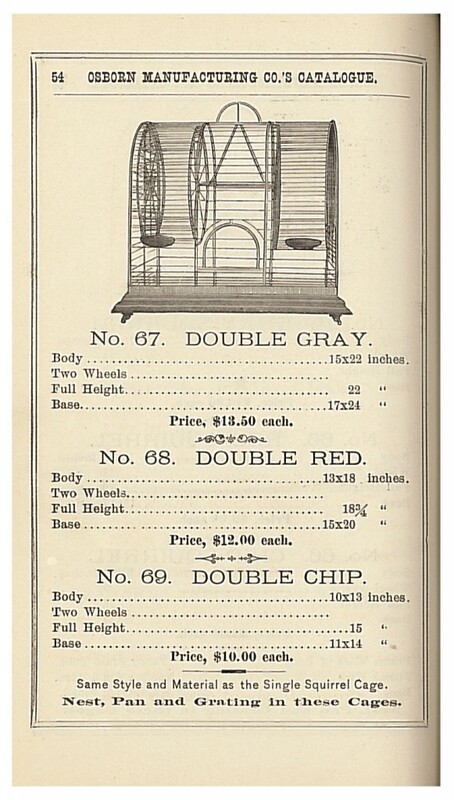 Catalogue of the Osborn M’F’G Co., 1885, page 54, double cages for two gray squirrels, two red squirrels, or two chip squirrels. All the cages came with a wheel, just like a hamster cage! The double squirrel cage had two wheels so the squirrels could run at the same time. Just like the size of the overall cage, the size of the wheel varied depending on whether it was for a gray squirrel, red squirrel, or chip squirrel. Each cage came with a nest, pan, and grating. The base of the cage was made of black walnut with an oil finish. Fancy brass tubing made up the framework of the cage body and the filling wire was composed of English Tin’d Wire. Like most people I love to watch the Squirrel’s play. I didn’t know back 1800’s that Osborn Manufacturing Co’s sold Squirrel cages, don’t know anyone sold Squirrel cages with a wheel like a Hamster cage! I want visit that museum, must be beautiful see that quantity of books together, 120,000 books titles is excelent to spend to much time reading.